Daniel (Dan) Lewis was born in Maerdy on 11th December 1902. He played local football in Wales before joining Clapton Orient in 1923. Leslie Knighton signed Lewis in August 1924 and he made his league debut for Arsenal against Everton on 15th November 1924. In that season he played in 14 games. Herbert Chapman became manager in the summer of 1925. One of his first signings was Bill Harper, who cost £4,000 from Hibernian. He replaced Lewis as Arsenal's first-choice goalkeeper. Harper played in the first 20 games of the 1926-27 season until Tottenham Hotspur beat them 4-2 at Highbury. Lewis now returned to the first-team. His form was so good that he won the first of his three caps for Wales that season. Henry Norris refused to allow Herbert Chapman to spend too much money to strengthen his team and in the 1926-27 season Arsenal finished in 11th position. However, they did enjoy a good run in the FA Cup. They beat Port Vale (0-1), Liverpool (2-0), Wolverhampton Wanderers (1-0) and Southampton (2-1) to reach the final at Wembley against Cardiff City. 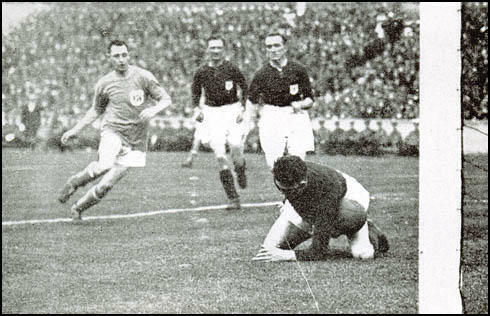 With 17 minutes to go, Hughie Ferguson hit a shot at the Arsenal goal that was partly blocked by Tom Parker and the ball slowly rolled towards Lewis. As Lewis later explained: "I got down to it and stopped it. I can usually pick up a ball with one hand, but as I was laying over the ball. I had to use both hands to pick it up, and already a Cardiff forward was rushing down on me. The ball was very greasy. When it touched Parker it had evidently acquired a tremendous spin, and for a second it must have been spinning beneath me. At my first touch it shot away over my arm." Ernie Curtis, Cardiff's left-winger, later commented: "I was in line with the edge of the penalty area on the right when Hughie Ferguson hit the shot which Arsenal's goalie had crouched down for a little early. The ball spun as it travelled towards him, having taken a slight deflection so he was now slightly out of line with it. Len Davies was following the shot in and I think Dan must have had one eye on him. The result was that he didn't take it cleanly and it squirmed under him and over the line. Len jumped over him and into the net, but never actually touched it." In the words of Charlie Buchan: "He (Lewis) gathered the ball in his arms. As he rose, his knee hit the ball and sent it out of his grasp. In trying to retrieve it, Lewis only knocked it further towards the goal. The ball, with Len Davies following up, trickled slowly but inexorably over the goal-line with hardly enough strength to reach the net." Jack Butler and Tom Parker watch Dan Lewis letting the ball slip under his body. 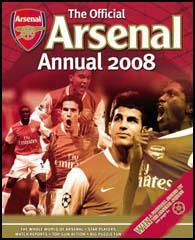 Soon afterwards, Arsenal had a great chance to draw level. As Charlie Buchan later explained: "Outside-left Sid Hoar sent across a long, high centre. Tom Farquharson, Cardiff goalkeeper, rushed out to meet the danger. The ball dropped just beside the penalty spot and bounced high above his outstretched fingers. Jimmy Brain and I rushed forward together to head the ball into the empty goal. At the last moment Jimmy left it to me. I unfortunately left it to him. Between us, we missed the golden opportunity of the game." Arsenal had no more chances after that and therefore Cardiff City won the game 1-0. After the game Lewis was so upset that his mistake had cost Arsenal the FA Cup that he threw away his loser's medal. It was retrieved by Bob John who suggested that the team would win him a winning medal the following season. Herbert Chapman believed that Lewis was the best goalkeeper at the club and he retained his place in the team the following season. However, some fans openly accused him of deliberately allowing the shot to slip from his grasp in order to help his fellow countrymen to win the cup. Herbert Chapman gradually adapted the "WM" formation that had originally been suggested by Charlie Buchan. Chapman used his full-backs to mark the wingers (that job had previously been done by the wing-halves). He also developed what became known as the counter-attacking game. This relied on the passing ability of Alex James and goalscoring forwards like David Jack, Jimmy Brain, Joe Hulme, Cliff Bastin and Jack Lambert. Chapman also built up a good defence that included players such as Dan Lewis, Bob John, Eddie Hapgood, Herbert Roberts, Alf Baker, Tom Parker and George Male. 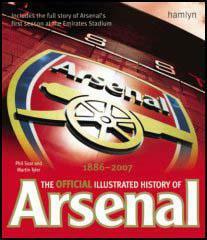 Success was not immediate and Arsenal finished in 14th place in the 1929-30 season. They did much better in the FA Cup. Arsenal beat Birmingham City (1-0), Middlesbrough (2-0), West Ham United (3-0) and Hull City (1-0) to reach the final against Chapman's old club, Huddersfield Town. Dan Lewis had played in six of the seven ties on the way to the final. However, Herbert Chapman took the controversial decision of dropping him from the team. Arsenal won the game 2-0 with goals from Alex James and Jack Lambert. Lewis was devastated by Chapman's decision and asked for a transfer. He was eventually sold to Gillingham in May 1931. During his time at Arsenal he played in 167 league and cup games for the club. Dan Lewis died in July 1965. It looked as if neither side was going to score. Then seventeen minutes before the end, Dan Lewis, Arsenal goalkeeper, made the tragic slip that sent the Cup to Wales. Hugh Ferguson, Cardiff centre-forward, received the ball about twenty yards from goal. He shot, a low ball that went, at no great pace, straight towards the goalkeeper. Lewis went down on one knee for safety. He gathered the ball in his arms. As he rose, his knee hit the ball and sent it out of his grasp. In trying to retrieve it, Lewis only knocked it further towards the goal. The ball, with Len Davies following up, trickled slowly but inexorably over the goal-line with hardly enough strength to reach the net. It was a bitter set-back. Even after that, Arsenal had a chance of pulling the game out of the fire. Outside-left Sid Hoar sent across a long, high centre. Tom Farquharson, Cardiff goalkeeper, rushed out to meet the danger. The ball dropped just beside the penalty spot and bounced high above his outstretched fingers.Jimmy Brain and I rushed forward together to head the ball into the empty goal. At the last moment Jimmy left it to me. I unfortunately left it to him. Between us, we missed the golden opportunity of the game. I got down to it and stopped it. I can usually pick up a ball with one hand, but as I was laying over the ball. I had to use both hands to pick it up, and already a Cardiff forward was rushing down on me. The ball was very greasy. When it touched Parker it had evidently acquired a tremendous spin, and for a second it must have been spinning beneath me. At my first touch it shot away over my arm. I sent my hand after it and touched it. I may have sent it quicker over the goal line with this touch but I think it would have reached it in any case.